A break of few weeks or months in the terrorism makes us happy that terrorism has ended. Politicians in power start point scoring that they have established peace but when a terrorist attack incurs we realize that govt. has not made any progress on its own plan to tackle terrorism. Once again public is fooled with the new claims, commitment and slogans to uproot terrorism. After death of dozens of innocent men, women and children in the bomb blast over the shrine of Laal Shehbaz Qalandar, the first decision taken was to close the Turkham Border crossing which shows that security agencies had the reports that suicide bombers had come from Afghanistan as per routine. Before blasts, intelligence agencies had warned that suicide bombers had entered into Pakistan from Afghanistan. 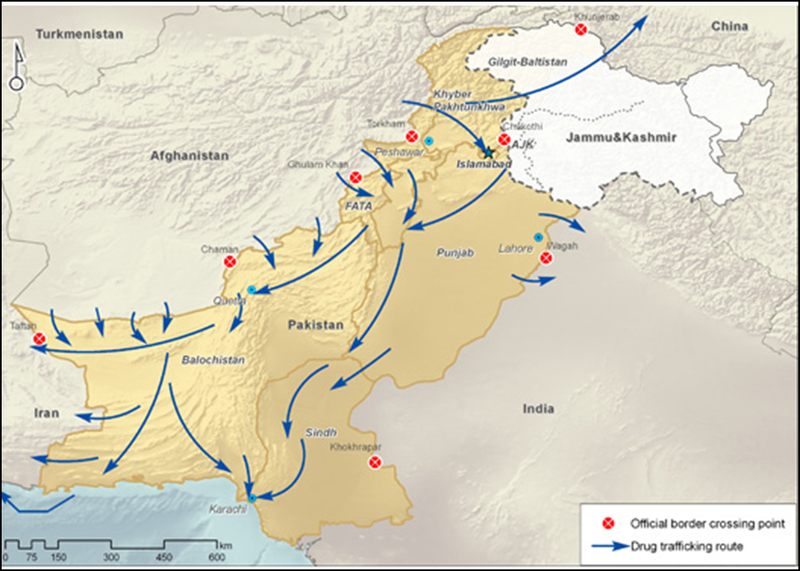 Now when the 5 terrorist suicide attacks have been conducted within Pakistan it shows that not only Turkham but there are other secret routes on Eastern and Western borders to infiltrate into Pakistan. As a result of sacrifices and appreciable efforts of the security forces in Operation Zarb-e-Azb although terrorism has been controlled too much extent. In the way Pakistan army has cleansed Tribal areas from terrorists which were termed even by British forces as “no go areas” and operation there as being impossible. British Generals were astonished at the achievements of the Pakistan army in these areas. But the fresh air of terrorism shows the steps linked with the Operation Zarb-e-Azb have not been taken yet to make it successful that were inevitable including Nation Action Plan (NAP) and establishing coordinated system of checking over the border. Both of these actions require heavy funds, legal protection and political support from the govt. But govt. either showed unwillingness or reluctance in these steps due to which Pakistan army had to take the decision of implementation of border management over Turkham and condition traffic across the border with the availability of documents of journey. In this regard in June 2016 construction of gate was started which was unacceptable for anti-Pakistan powers controlling Afghanistan especially India. On 14th June 2016, Afghan forces started unprovoked firing over the border in order to stop construction of the gate which claimed lives of soldiers of Pakistan army and Major Jawad Ali Changezi. However, Pakistan army completed the construction work and implemented the procedure of checking of documents of those willing to move across the border. 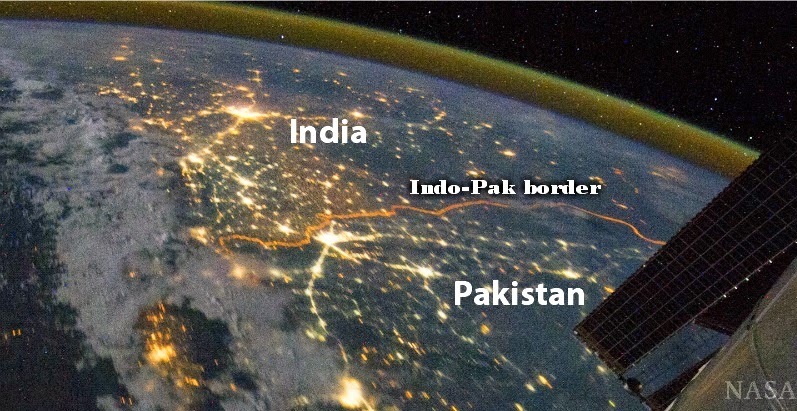 Despite of all this, the Pak-Afghan border is 2430 kilometers long and there are many passes from where terrorists infiltrate into Pakistan. A trench (14 feet wide and 11 feet deep) of 1100 kilometers length have been dug up which is not easy to cross. 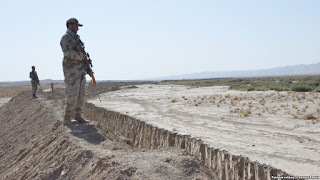 The areas adjacent to KPK border where there are mountains or ditches it is not possible to dig trench or erect walls; only possibility to stop terrorists is through manpower. This requires big numbers of manpower of Border Security Force or Rangers but we will have to wait for few years to train the special troops for being deployed in these areas. 1) Entering in Pakistan areas over unpopulated areas from the sea routes through small boats under the garb of fishermen. In order to tackle this situation Pakistan Navy has started patrolling over the sea. China has handed over two warships to Pakistan equipped with latest systems to Pakistan for protection of Gawadar port. Moreover, 2 Chinese Nuclear submarines are also present in the sea. The ships of Pakistani Navy are also patrolling the area but it is not possible to monitor the borders over the open sea hundred percent. In this regard there is the need of a sophisticated security system under NAP so that if any terrorist succeeds to infiltrate into Pakistan, he can be easily pointed out and hunted down. 2) Second option of infiltrating agents and terrorists is through the traditional way of using fake / forged identity documents over the international airports or sea ports to enter into Pakistan. Even the most modern security equipment and professional training of manpower in Europe have failed to stop such infiltration. Because for this purpose smuggling gangs from under world are utilized who are not only expert in trafficking of women, drugs and weapons but also have cooperation from the corrupt govt. officials as well. The weapons daily being recovered from Balochistan and Karachi are coming from the outer world and we should not forget about the thousands of NATO containers that were stolen / lost into Pakistan and have not been traced yet. 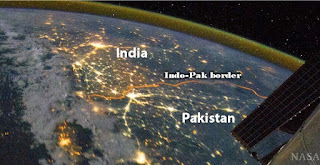 3) The third option is to exploit the 2912 kilometers of Indian border along with 740 kilometers long Line of Control (LoC). 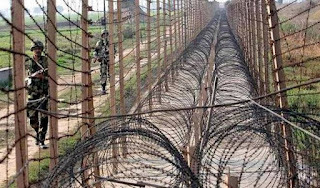 Although India has constructed barbed wire wall over the border. 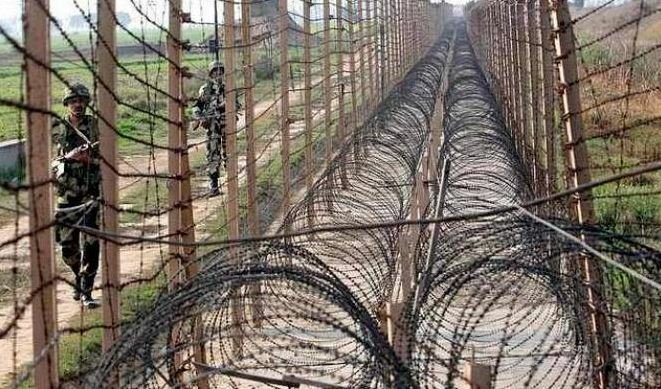 This barbed wire wall is half to one kilometer away from Zero line. The land outside the barbed wire wall is being cultivated, Indians have constructed iron gates in the barbed wire wall, Indian farmers pass through these gates for cultivation of their land. On the Pakistani side we have only Rangers to look after the crossing across the border. For this we have 300 to 400 personnel in order to look after every 100 kilometers of the area. 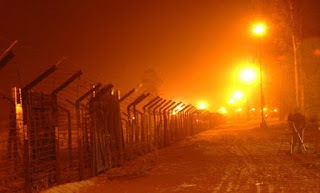 India has constructed small mud rooms or huts outside the said wall; in the day Indians hide their agents in these huts or rooms who attempt to enter into Pakistani area in the dark of the night. Some of them are hunted down while others succeed in crossing the border. Similar procedure is used by the smugglers. It is not possible for the Rangers to ensure 100% observation over the border due to open border. In 2002, Indians utilized the Rajasthan border for supply of weapons and ammunition to Indian supported terrorists in Balochistan. For this purpose a town named as Kishan Garh was chosen by Indians which is only 5 kilometers away from the border. If we look at the map, the provincial border of Punjab-Balochistan is only 130 kilometers away from this town. Indian intelligence took up the control of godowns of smugglers from Kishan Garh to Shah Garh (190 kilometers of area over border) with the help of Police and civil administration and converted them into weapon depots. Initially, mines, KKs, hand grenades, dynamite, RPG and telecommunication equipment was smuggled into Balochistan, Pakistan. After a big number of these lights weapons were dumped into Balochistan, Indians started smuggling heavy machine guns and mortar guns. According to, Andrew Gavin a US journalist all these weapons were smuggled into Pakistan through traditional way of smuggling where it was laid upon the camels and transported to the smuggling areas of Sindh from where it was laden into small trucks hidden under other goods and at least reached Balochistan. Truck drivers, labor and Police on patrol took these as commonly smuggled goods like wine, dry spices etc. 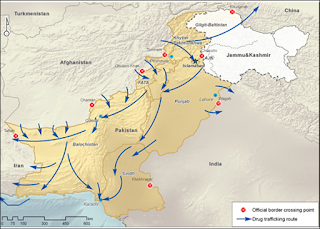 After establishing a well-coordinated system, training centers of terrorists in Balochistan the system of supply of weapons was shifted to Afghanistan in 2005. With the start of 2005, the terrorist activities on the large basis started into Balochistan which needed uninterrupted supply of weapons and ammunition. In order to address these needs India established a well-coordinated supply system through Dalbaddin, Noshaki, Khuzdar and Dera Bugti from Afghanistan. The movement of weapons and trained terrorists was monitored by Israeli satellite. Here I would like to mention a report of CNN on 12 February 2009, in which Germany has sought explanation from US officials in Afghanistan that 60% of the weapons provided by Germany in 2006 for Afghan army and Police have been missing. After the disclosures from Germany, when US intelligence agency inquired the weapons provided to Afghan soldiers and Police from 2004 to 2008, it was revealed that out of 242000 light machine guns, automatic long range rifles and other weapons, 87000 have not been put in record at all while the 460091 rifles entered into record are physically missing. Indian forces were given the responsibility of training Afghan soldiers / police and hand over these weapons to Afghans. But Indians sold these weapons to Afghan militants and the rest was smuggled into Pakistan to be utilized by Indian agents in Balochistan Pakistan for which Pakistan has to launch Operation Zarb-e-Azb.